Leading Calgary home builders know that you’ve got to make the right choices during construction to optimize energy efficiency in your new house. Conserving energy requires much more than using LED light bulbs and installing EnerGuide-rated appliances. It demands a carefully engineered whole-house approach that creates efficiency layer by layer, and it begins with your lot. When it comes to maximizing energy efficiency, your primary consideration should be the lot’s orientation relative to the sun. This is true regardless of whether you’re concerned about maximizing sun exposure for photovoltaic solar panels or minimizing it as a strategy for reducing summertime heat gain. One thing to watch for in both cases: the sun’s position in the sky varies from season to season. Its peak position at noon during the winter is much different than its peak position at noon during the summer, so be sure to take note of this if sun exposure is a major concern of yours. Structural insulated panels (SIPs) make great alternatives to conventional insulation. Made up of thin a thin board of polystyrene built between two plywood sheets, SIPs reduce waste, cut greenhouse gas emissions and help reduce household resource consumption and operating expenses. Because they are so effective at inhibiting thermal transfer, SIPs provide energy-saving benefits in both winter and summer. They offer one of the easiest and most affordable ways to dramatically improve your home’s overall efficiency. Fine Line Homes is pleased to offer a comprehensive range of siding products that boost overall energy efficiency and increase your pride of ownership. Remember, too, to look for windows and doors built with recycled, recyclable, or otherwise eco-friendly materials. 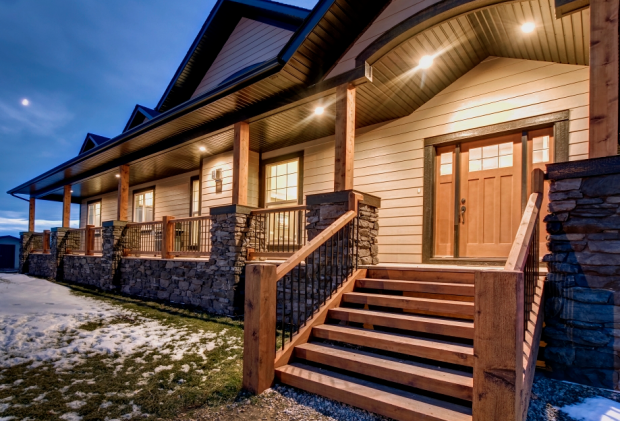 Fine Line Homes is a leading Alberta-based builder of custom homes. We use the latest building technologies and best practices to create stunning houses that optimize energy efficiency. Our design and engineering teams work closely with clients, bringing their visions to life and helping them meet their lifestyle needs and goals. Many home buyers balk at the possibility of building a new custom home, fearing it will cost more than they can afford. However, the truth is that custom homes don’t have to cost a fortune. In fact, the Fine Line Homes team can create new houses with price tags that compare favourably to what you would pay for a home on the resale market. However, building a custom home gives you the freedom to customize the layout, floor plan, building materials and interior options, ensuring your complete satisfaction with the finished product. No more compromising! Our custom homes also tend to have higher resale values than comparable standard-built homes because of our quality craftsmanship and attention to energy efficiency. We provide energy modeling, door blower testing, pre- and post-drywall inspections and an EnerGuide rating for all our homes. To learn more about Fine Line Homes and the custom home building process, please don’t hesitate to contact us.